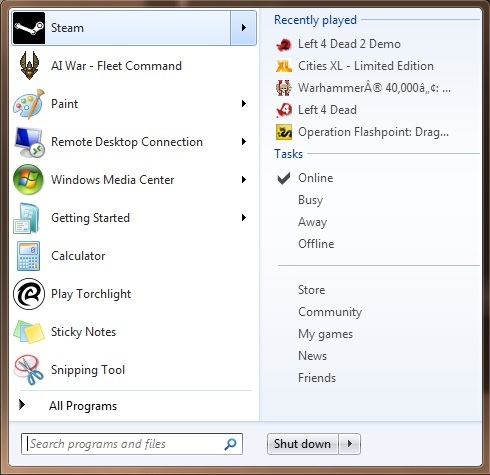 If you're a fan of Steam and happen to be running Microsoft's recent Windows 7 operating system, you're in for a treat. The latest Steam update adds full native Windows 7 support for features like jump lists and process bars. What does that mean? Seen above you'll have quick access to recent games, mostly co-op ones in my case, quick online tasks as well as one click access to all the tabs. The best part is Steam doesn't need to be running to take advantage of these features. Finally while Steam updates, the task bar icon will show the progress in real time. Suddenly your Left 4 Dead and Dawn of War 2 sessions got a whole lot easier. While you're updating Steam, don't forget to join our Steam Group! Page created in 0.7677 seconds.